Q. How do I link Walden Library to Google Scholar? You can link the Walden Library to Google Scholar by changing the Library Links setting in Google Scholar. This allows you to access the Walden Library's subscriptions when searching Google Scholar. IMPORTANT NOTE: The manual connection lives in the browser's settings. When you clear your cache it deletes this setting. You will have to reconnect to the Walden Library after clearing your cache. In the upper left side of your screen, click on the three lines. In the left column, click on Library Links. In the search box, type in Walden and click the blue Search button. An option for Walden University - Find at Walden will appear below the search box. Click in the box next to it. Note: If you see the a box for Open WorldCat - Library Search box , check that too. This will allow it to link to any freely available content. Click Save. This setting will be remembered until you clear your browser cookies. Tip: You might be taken back to the setting page. 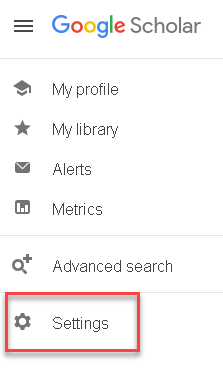 Click Save again to go back to the Google Scholar search box. Now when you search Google Scholar, you will see Find at Walden links to the right of articles it thinks we have in the Library. When you click on Find @ Walden you will be asked to log in with your Walden username and password. You may see a list of databases that contain the article. Pay attention to the years, as not all databases will have the same coverage years. Click on the database you want to try and it should take you to the article.